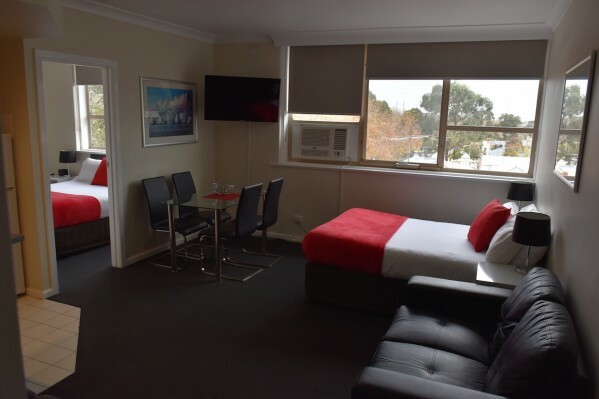 Apartments on Flemington - PH : 03 9329 3977 Book Direct 2 Save. Reception Hours : Reception hours are from Mon-Fri: 8am-6pm, Sat/Sun/Public Holidays: 9am-1pm. Guests can check in from: 2pm until 6pm. Guests are requested to state their arrival time on their booking. After Hours : Guests arriving outside Reception hours are asked to contact 03 9329 3977 to receive the after-hours access codes as the property will be locked at 6pm weekdays and 1pm Sat, Sun & Public Holidays. BBQ facilities, luggage storage, non-smoking rooms, family rooms, heating and air-conditioning. Car Parking : Limited on-site car parking is available but cannot be guaranteed. A request can be put in at time of booking but availability will not be known until the day of arrival. Parking is $10 per night payable at Reception on arrival. When car park is full you may be asked to leave your car key at Reception. On-site parking will not be available to anyone not wanting to leave their keys. Street parking is available if needed. Parking restrictions apply. Getting There : Approximately 2km to Melbourne CBD. Approximately 1km to Queen Victoria Market. Enjoy Melbourne's exciting attractions when you stay at Apartments on Flemington. Lygon Street restaurants, Queen Victoria Market, Flemington Racecourse, Melbourne Showgrounds, Melbourne Zoo, State Hockey and Netball Centre, Melbourne University, Royal Park. Nearby Errol Street, North Melbourne has supermarkets, chemists, hairdressers, restaurants, post office and banks. © Copyright – Apartments on Flemington All Rights Reserved.